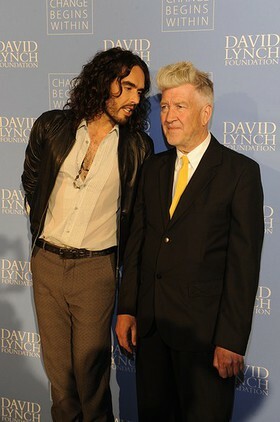 David Lynch and Russell Brand joined forces to help bring Transcendental Meditation to 1,000,000 at-risk youth at the U.S. premiere of Meditation Creativity Peace at the Hammer Museum’s Billy Wilder Theater in Los Angeles on Tuesday, April 2. The premiere marked the launch of the “Meditation in Education” global outreach campaign. Meditation Creativity Peace is scheduled to premiere in London, Paris, Berlin, Tel Aviv, Johannesburg, Tokyo, Rio de Janeiro, Buenos Aires, Toronto and other global cities during May and June. The film will also be screened at the Palm Beach International Film Festival in West Palm Beach, FL on Saturday, April 6. The documentary chronicles Lynch’s 16-country tour of European and Middle Eastern film schools in 2007, when he addressed tens of thousands of students about his creative processes, filmmaking and his 40-year practice of Transcendental Meditation. The Billy Wilder Theater holds nearly 300 people, but more than 1,000 people unexpectedly showed up at the box office. The additional film buffs were able to view the documentary in an overflow hall at the museum and on large outdoor screens mounted in the museum courtyard. Russell Brand, a four-year meditator, said that TM had helped him overcome his decades-long addiction to drugs and alcohol. 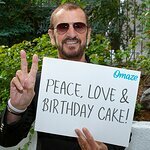 “I have become a better human being through meditation,” Brand said. 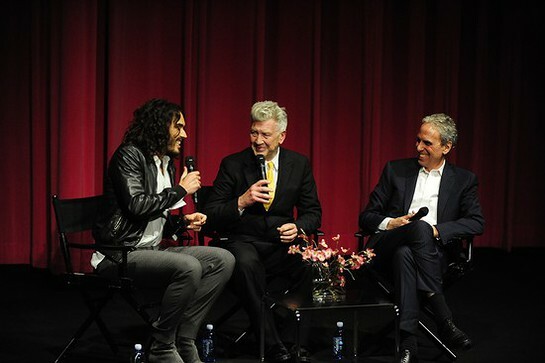 Lynch and Brand were joined onstage after the film by Bob Roth, executive director of the David Lynch Foundation, for a 20-minute Q&A. Roth said the David Lynch Foundation has provided scholarships for over 250,000 at-risk youth to meditate worldwide and is expanding its work to support veterans who suffer from post-traumatic stress and women who have survived domestic abuse. The David Lynch Foundation (DLF), a nonprofit charity, brings Transcendental Meditation to underserved populations including inner-city youth, women and teens who have been victims of violence, veterans with post-traumatic stress, homeless adults and teens and incarcerated adults and juveniles. The Foundation has received public support from Hollywood luminaries such as Dr. Mehmet Oz, Ellen DeGeneres, Jerry Seinfeld, Gwyneth Paltrow, Katy Perry, Hugh Jackman, Martin Scorsese, Naomi Watts and Laura Dern.